The pretty Finborough Theatre in West Brompton plays host to the European debut of Rodgers & Hammerstein's famous musical "State Fair" for nearly a month, starting from Tuesday 4th August. At first glance you may be forgiven for underestimating the clout that this small traditional fringe theatre has had but, rest assured, the Finborough can more than hold its own when it comes to lavish productions and is a successful spawning ground for talent including the director of this production, Thom Sutherland. He makes use of space and acoustics to maximum degree and has worked on several West End productions including Mack & Mabel and Diary of Anne Frank. "State Fair" is set in the traditional Amercian mid-west in the mid 40's and centres around a family attending the Iowa State Fair in 1946. The parents want to win prizes and the kids want to discover romance at the event. 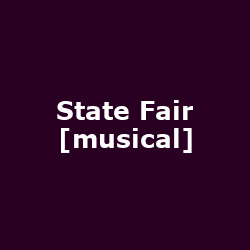 State Fairs are a mix of farmer's markets, fairgrounds and picnics all rolled into a heady mix of circus and drama, ideal for R & H songs to permeate and enthral. Numbers such as 'It's A Grand Night For Singing' and 'It Might As Well Be Spring' have become standards for musical fans young and old and this venue promises to make them sound a little more personal and intimate. The Iowa State Fair attracts around a million visitors a year - this one might not quite reach that number but it is sure to be a consummate performance and production given its location. There are special £5 tickets available for the 1st week of productions for under-30s (online only so hurry) while preview performances run on the 4th and 5th August - tickets cost just £9. Otherwise other tickets for the main run (6th August to 29th August) start at £13, although there are various concessions also available (check the website). Nearest tubes (5 mins walk) are Earl's Court or West Brompton (there is also a BR station at the latter). The theatre is halfway between the Old Brompton Road and Fulham Road. Leave the car at home and let public transport take the strain as there is limited parking!